important to make sure your audience is appropriate for the services you provide. 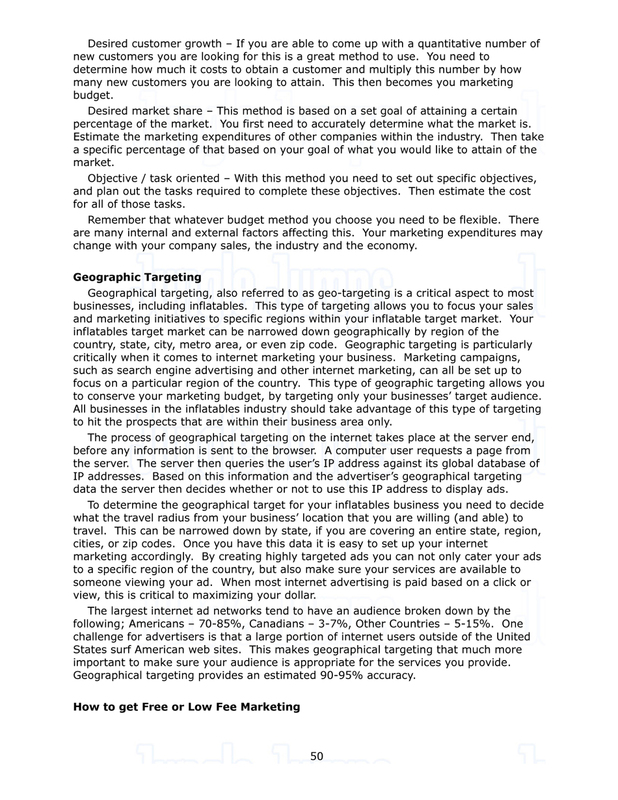 Geographical targeting provides an estimated 90-95% accuracy.How to get Free or Low Fee MarketingThere are hundreds of ways to market yourself and your company, many of these methods don’t cost any money. The methods you choose should be a part of your overall marketing plan. It should be a consistent plan that you undertake everyday no matter what. Here are some free and low cost methods of marketing that have worked for other business owners and can work for you:1. Email signature line: Believe it or not your email signature can help market your products. Every business and individual has email. Think of all the people you have access to. That is a lot of people. All you have to do is add a blurb about your business, along with a link to your website in your auto signature. 2. Your own blog: Today, blogging is a major way of marketing yourself and your business. With a blog you can talk about yourself and what you have been doing. What better way than to talk about your business with a link to your website. If you don’t have a blog, just go to www.blogger.com and set one up. 3. Blog at other blogs: Blogging at other blogs is just like blogging at your own. You type in vital info that will be pertinent to your industry and include a link to your website. For example focus on parenting sites where parents are blogging about party ideas for their children.4. Craislist.com: Here is a very good way to advertise your business. There is a section for self-employed and entrepreneurs to advertise their services. Why not put in an ad and see what happens. In most cases, an ad will be free of charge. 5. Article marketing: This is a free way of marketing your business. All you have to do is write an article about your business or industry and place that article in an article directory. Make sure to include a link to your website and contact information in your article. This way when people read your article, they will see your link and click to find out more. 6. Offer previous or inactive clients discounts: One great way to garner business is by offering discounts to previous clients or clients that have become inactive. Why not go after them with special offers or incentives. This way you can get them back. 7. Display your cards or brochures at coffee shops, book stores, businesses of people you know, membership stores like Costco and Sam's Club. Basically, place your cards and brochures wherever you are allowed to. Don’t forget to place your cards and brochures with vendors who sell the equipment you need. They probably get a lot of clients, who come in asking for leads of entertainment companies the vendor knows are legit. Take advantage of that.8. Why not hold an open house, ribbon cutting ceremony, or event and post this event on street poles, in the paper, or wherever you can to reach people. When people come to your event and see what your business is, you’ll get instant clients. 9. The cheapest form of marketing you can do is networking. All you have to do is find organizations, associations, chambers, groups and monthly meetings that have attendees and members that fit your unique target market and pay them a visit. The key to networking is frequency. You have to attend the meetings on a monthly basis is if you are going to do any good with it.